The visitors were once reduced to 19/3 in the 11th over. India could’ve had a worse day on the first day of the opening Test against Australia at Adelaide Oval. They lost wickets at regular intervals as the hosts’ bowlers got them on the mat. However, Cheteshwar Pujara showed nerves of steel, scored a superlative century and guided his team to safer shores at the close of play. In the end, Virat Kohli and Co ended the day on 250/9 in 87.5 overs. After India won the toss and elected to bat first, they got off to a poor start, having lost quite a few quick wickets. All three of KL Rahul, Murali Vijay, and skipper Virat Kohli got out, fishing outside the off-stump. Even as Josh Hazlewood nipped Rahul, Mitchell Starc and Pat Cummins got rid of Vijay and Kohli respectively. All of a sudden, the visitors were reduced to 19/3 in the 11th over. Ajinkya Rahane also couldn’t contribute and became Hazlewood’s second victim for 13 runs. Rohit Sharma, who was making his Test comeback, showed intent and smacked three sixes, two of which came off Cummins, to score 37 runs. Nevertheless, he played one shot too many and was dismissed by off-spinner Nathan Lyon, caught by Marcus Harris at the deep square leg region. Rishabh Pant got the measure of the conditions and the bowling after scoring 25, but Lyon got rid of him as well. On the other hand, Cheteshwar Pujara didn’t throw his wicket away and looked pretty much at ease. He smacked a couple of sixes but didn’t resort to any undue risk. The Saurashtra batsman played until the very end and scored 123 patient runs from 246 deliveries. He came to bat in the third over and was the last wicket to fall in the day, courtesy of a direct hit from Cummins. Ravichandran Ashwin also did his bit and notched 25 runs to build a 62-run stand with Pujara. The dismissal also brought the curtains down on the day’s play. From Australia’s perspective, Starc, Hazlewood, Cummins, and Lyon picked up a couple of wickets each. 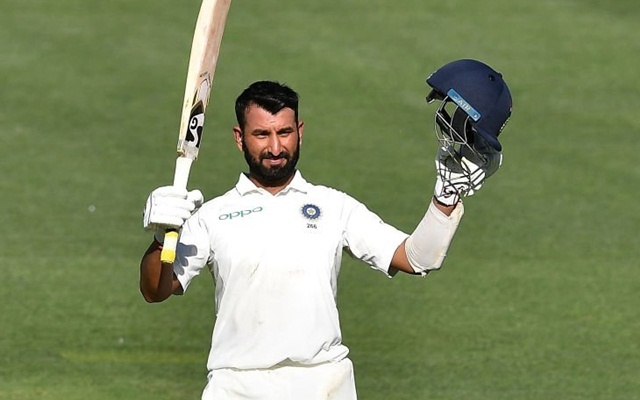 What an incredible innings from @cheteshwar1. One of his most important centuries considering the situation we were in! He has single handedly given bowlers the runs to defend! 1 pt – Pat Cummins. PS – Just out of curiosity ! I definitely Heard a sound there when Pujara was on 89. Don't know what it was. Was surprised to see Aussies not going up for the review. Was it out or not out ?